Crewe Alexandra boss David Artell has admitted Keith Curle’s constant tinkering with the Cobblers’ personnel and formation will cause him a few headaches ahead of Saturday#s meeting between the clubs at Gresty Road (ko 3pm). Describing Curle’s team selection as being unpredictable would be an understatement. Even after claiming victories, the Town boss is liable to make changes, whether it be hrough team or formation changes, and Artell admits that is an issue for him as he prepares hisi team to take on the Cobblers. 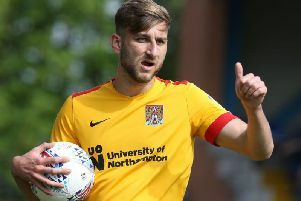 “Saturday will be another tough game,” said Artell, a former Cobblers defender. “Northampton are a big, physical side and Keith knows what it takes. He knows the league and we know it won’t be easy. “We will be mindful of what Northampton do. They change their formation a lot so that is something we will work on, but I’m sure they will be worrying about us as well. Crewe go into Saturday’s game off the back of a 2-1 defeat to Exeter City, and they are now 14th in the Sky Bet League Two table. But the Cheshire side are still clinging on to the hope they can make a late charge for the promotion play-off places, although Artell knows there is no room for more errors. “I am not a big believer in pressure because it is often seen as a negative. “I believe in mindset and using that pressure and challenge as a positive. “I didn’t feel pressure 10 weeks ago, I don’t feel pressure now and I won’t in 10 weeks’ time. “You have to embrace the challenge and use it as positive. “If you think about this or that too much or worry about things that you cannot control then you can lose focus on what is important. “I don’t think the players are feeling any real pressure. “If they are, put it on to me. I don’t want them to feel pressure because when they think negatively it can make them tense or nervous in their performance.